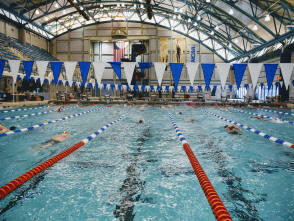 Welcome to Excel Swimming, Long Island's premier swim program for adults age 18 & older headquartered at the Nassau County Aquatic Center in Eisenhower Park, which is easily accessible from all major area highways. We offer several term membership options with weekday morning, weekday evening and Sunday morning swim sessions for a variety of ability levels, all conducted under the supervision of a professional, certified coaching and teaching staff. 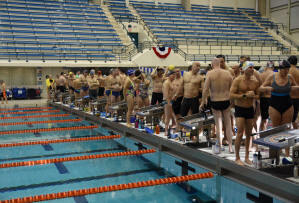 Participants can select from challenging workouts for experienced, advanced-skill competitive swimmers and triathletes, our "combo" lanes which incorporate technique skills with training, private lessons and/or small-group technique instructional clinics. We have something for everyone ~ whether you are simply interested in health and fitness activities or losing weight in an encouraging environment, need to improve technique for greater efficiency and ease in the water, or are a competitive athlete looking for motivating group training dynamics ~ you can find it all with Excel Swimming! to schedule participation in a free trial workout or ability evaluation appointment. Contents Copyright © 2019 Excel Swimming Ltd. ® All Rights Reserved.